I love being away. Especially when it’s to familiar, yet massively exciting London with my family. But, boy do I love coming home. I bet you are the same. There is something about your own bed and bath that is quite primal. Safety and familiar-comforts ultimately trump the unknown – however much fun. But we really had a terrific time, despite some pre-travel nerves at arriving while the situation in London was still volatile. Well I was jittery, Mr A and Miss R were their usual breezy, up-for-it selves. And they of course were right. We had a ball. 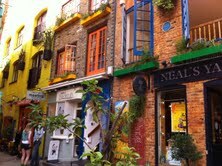 Although the riots and the lead up to them were deeply worrying and unsettling, the London we experienced was universally uplifting and positive. Everyone we encountered was friendly, helpful and polite – from the harassed Tube station staff (I was the zillionth person to ask the same dumb question), the stall holders in every market we visited, to the alarmingly young and fresh-faced policemen and women we asked directions. Even when I just about took out an elderly lady with my oversized ‘new’ vintage bag, having spied yet another pop-up vintage market to blow my money in, she just smiled and said, ‘It’s awright, my love’. We also have the same experience in Paris. It always surprises us that London, and Paris in particular, is perceived as being populated with surly, eye contact-avoiding citizens who would sooner spit on you than help you. A little effort with the language, a show of politeness, and a smile are all we have ever found necessary to get on in these famously bustling cities. Maybe we have just been lucky but I do think that a bit of the old ‘do unto others as you would be done by’ can’t hurt. As well as the welcoming atmosphere, the food we ate was also a treat. We don’t do fancy restaurants, but we do eat well. One of the best things I have ever eaten anywhere was from the rather divey-looking Viet, on Greek Street (Soho). While queueing outside for a table, we perused the short, classically Vietnamese menu and chose enough food for double our party. While other tables were demurely supping their fashionable pho, we plowed through piles of crunchy pancakes, fresh and zingy salads and herb-laced noodles. One table in particular seemed fascinated by the constant succession of fragrant dishes brought to us. But the very best thing was the savoury coconut pancake stuffed with prawns and vegetables. It was, according to Mr A (who, unlike me, isn’t prone to hyperbole), ‘worth the trip to London alone’. Luckily we had the foresight to order two. We must have looked quite a sight attacking this delicate dish with three sets of chopsticks. I was just glad we had skipped lunch, thus negating any guilt for ordering literally a table full of food – although it was super healthy. We were so entranced by the food that I didn’t sneak out the smartphone, so no pictures. But trust me, it was fabulous. I pity all of those people we saw joylessly chewing their fastfood burgers and doughy chain-restaurant pizzas when, for not much more money, they could be enjoying a fabulous, sensory-jolting meal like the one we had at Viet. We also had good meals at Tomasina Miers’ Wahaca (so much fun! ), Bodeans (not for the faint of heart, small of appetite, and definitely not for vegetarians) and at Szechuan-specialist, Ba Shan (sister restaurant to the more famous Bar Shu). For salt beef-stuffed bagels of your dreams you have to go to the stand-and-eat Beigel Bake, at the far end of Brick Lane. I think that was Miss R’s favourite food moment of the trip. 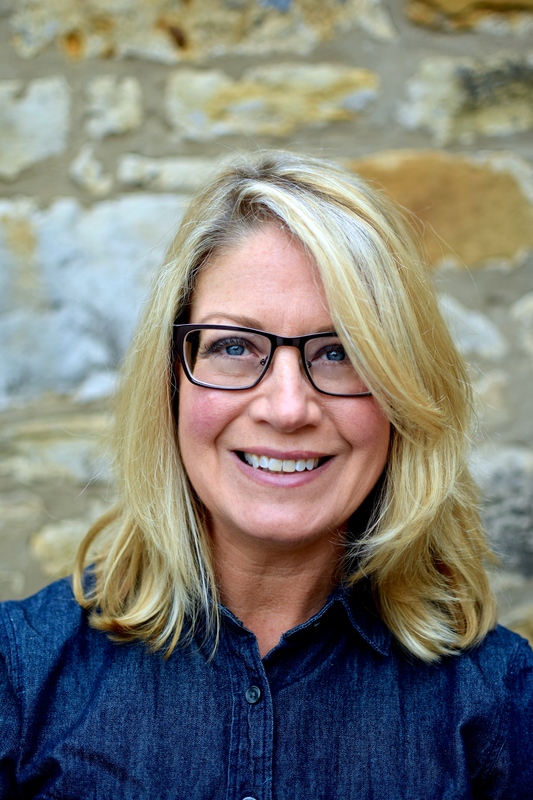 But I guess we sometimes need the familiar when everything around us is not – I am trying to give the (processed) burger-munchers the benefit of the doubt. London is a wonderful place for any price point or cuisine you can think. It seems a bit of a cop-out to opt for what even seems unimaginative and boring in your home town. As we literally staggered out into the crimson and charcoal-coloured evening we didn’t think it could improve, but a serendipitous pavement-side drink across from the liveliest club in Soho, and a quick cold cup of deliciousness from the most other-worldly frozen yogurt shop anywhere (Snog), capped off a wonderful meal, and day. Anyone who hates visiting London needs to have a word with me. I’ll change your mind, one restaurant at a time. Besides eating well we also concentrated on exploring the weekend markets. I think we ‘did’ all of the major ones except for the flower one on Columbia Road – Old Spitalfields, Brick Lane/Petticoat Lane, Portobello, Camden and last but not least Borough. Ah, Borough. I think it is the biggest food market in the world, but even if it isn’t it is certainly huge – and a bit overwhelming. 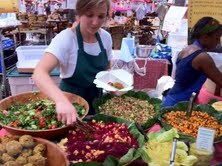 So many wonderful producers, so many beautiful displays, so many lip-smacking food samples. I’m not great with too much choice, but with a few deep breaths and a small glass of Prosecco the few hours we spent at Borough were some of the most memorable of any I have had in London. I even spent a good twenty minutes chatting with the knowledgeable and gentlemanly Alex from East Teas about all things green tea. I am now hooked on his Vietnamese tea, cheaper but just as polyphenol-packed as the Japanese grown teas. Highly recommended by others as an importer of superior eastern teas. They’re not wrong. One thing we have always noticed with proper food markets is that not only do they sell good raw produce they also sell good food to eat there and then. Sunday UpMarket by Brick Lane was particularly eye-opening, with probably two dozen stalls selling everything from vegetarian Ethiopian dishes to a Japanese version of the very British bubble and squeak. Arms laden with bags of market-bought food goodies and vintage finds we managed to eat – and shop – without stepping foot in a chain store. Result. Although we ate well (as you can gather), I was also pleased to get home and eat something homemade. I get a bit antsy if deprived of my kitchen surroundings for too long. But because I had to wait in for a plumber lunch needed to be cobbled together from my cupboards, and what was still viable in the fridge. 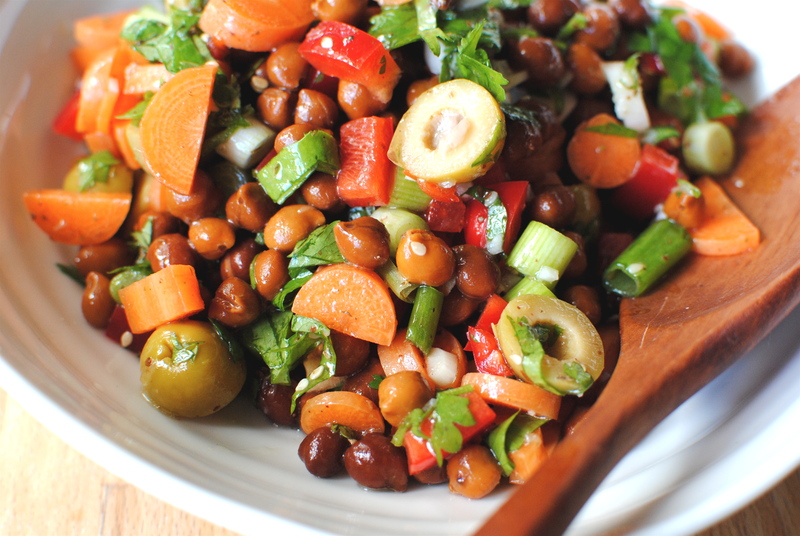 So Summery Chickpea Salad to the rescue! This is by far my most-eaten salad, not just because it is really a whatever-you-have-goes-in salad, but also because it is truly delicious. The main thing is the dressing and spice. Get that right and whatever else you fling in is of little consequence (well, nearly). I have given measurements of a kind, and ingredients that I use, but these are really suggestions. The basics are some type of bean, various crunchy veg, herbs, lemon, mild or hot chilli and your best extra virgin olive oil. I always add something like za’atar or dukkah, and nearly always olives, but it is up to you. This always gets made on self-catering holidays, using whatever is best at the market. But it is just as good made at home. Sweet home. Ahhh. Glad to be back. Nutrition Notes: As I don’t wish to lose you before you make it to the recipe (thanks for hanging in thus far), I will be brief. Everything that is in this salad is great for you, but one just doesn’t hear enough about the virtues of the humble, ever-reliable legume. And that’s a pity as legumes, and dried peas generally, really are nutrition superstars – a near-perfect balance of protein, fat and carbohydrates. They really are incredibly useful. We have known for some time that dried peas and beans help prevent seven types of cancer, balance blood sugar, decrease cardiovascular risk and help control weight (they are very filling, but not particularly calorific). In fact, most public health bodies recommend specifically mention legumes for preventing disease and optimising health (rather than lump them in with plant food in general). But until very recently the why hasn’t been well understood. It still isn’t – as is the case with many plant chemicals – but the short-chain fatty acid butyrate found in fibre may be a key compound, at least in cancer prevention. This 2003 study, although quite technical, gives a good idea of how this compound works to prevent colo-rectal cancer. In a more recent study, funded by the American Institute of Cancer Research (AICR), when cancer cells were treated with butyrate, their growth stopped, and led to their death (apoptosis). So far so interesting. But what is really fascinating is that while butyrate kills cancer cells it acts as an energy source (feeds) for the normal cells. The lead scientist, Leonard Augenlicht, stated “We don’t know why butyrate represses tumor cells, but it seems to inhibit the transcription of certain genes that cause cells to proliferate.” According to Augenlicht, one of these genes may be cyclin D1, which plays a major role in intestinal tumor growth. More general studies have found that having four to eight one-cup servings of legumes a week is health-promoting: the official US recommendation is 1/2 a cup – per week. Many of us consume a lot less than is optimal so this will seem daunting, but really, any increase will be beneficial. This goes for vegetables too – aim for higher than the government recommended amount for optimal health benefit, but any increase is useful. The main nutrients in chickpeas specifically are manganese, molybendum, folate, iron, phosphorus and copper. Chickpeas of course contain protein but they, like other legumes, are low in the amino acid (building block) methionine, so need to be eaten with some kind of grain or grain product to get this. Legumes contain lysine, which the grains lack enough of, so this this arrangement is called complementary proteins. That’s why I have recommended that you have this salad with pitta bread, but any grain will do. You might even like to mix in some cooked quinoa, couscous or spelt for extra protein and satisfaction. Chickpeas are great but to get all the benefits of legumes it is good to include a variety of them in the weekly diet. Here is a comprehensive list of legumes from around the world, but common ones are lentils (and there seem to be endless varieties), aduki, black bean, pigeon pea, mung, broad and lupin bean. For more info on chickpeas and other legumes try this link to World’s Healthiest Foods. We really love Puy lentils and black beans at casa foodtoglow. After you try today’s recipe have a go at this gorgeous Brazilian black bean salad recipe from a few months back. Cautions: If you have gout or kidney problems you probably should consume less than the recommended optimal amount. – stick with the lower US recommendation. The uric acid produced as legumes are broken down are not thought to have the same impact as that produced from meat, but not enough research has been done to be absolutely sure. A Canadian study into the effects of vegetable protein versus meat protein on uric acid production and clearance (among other things) showed that vegetables were actively helpful. This is a fantastic, punchy salad that will evoke the taste and smell of summer, even in the dead of winter. The vegetables are easily adapted to whatever looks best in the shops – or in your fridge. For such a small amount, don’t bother cooking dry chickpeas (all that soaking and boiling kind of kills spontaneity) – organic tinned ones are available at larger supermarkets and at health food stores. You can easily scale up or down this recipe, and it will keep for a day without the tomatoes (add the tomatoes when you are ready to eat). The chilli and anchovy-stuffed olives are sunny, zingy options, but don’t add them if you don’t like them. As I made this yesterday with post-holiday fridge bits, I didn’t have my usual cucumber, but it’s here for you to include – I love the cooling crunch contrast with the chilli. 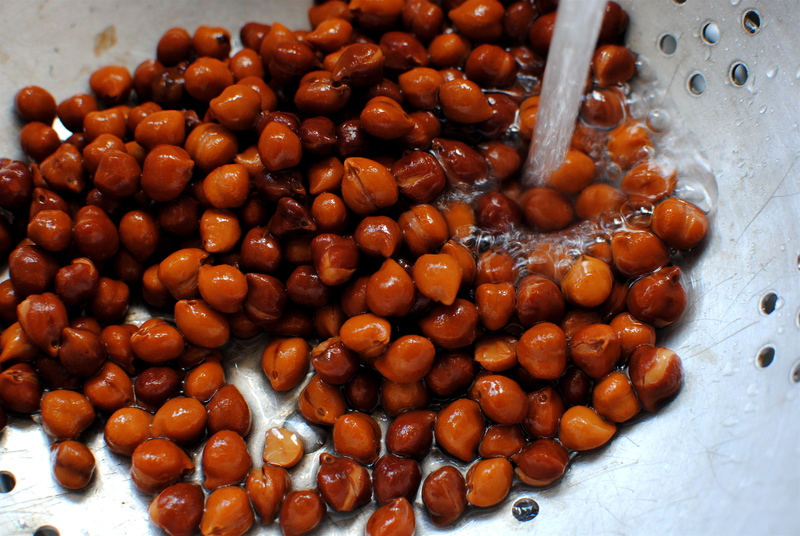 If you have the time, gently heat the chickpeas with a tiny bit of water until warm but not simmering; drain and very lightly crush – just so some are barely cracked. This will help absorb the oily-lemony juices. Mostly I just use them room temperature and whole. Your trip sounds lovely, glad to hear you had such a nice time! It was brillliant! It was especially nice for us all to be together and enjoy ourselves. Back to thudding, relentless rain! Bah to the rain! The weather is so changeable at the moment. great recipe, and a great excuse for me to use some dukkah – thanks! You’re welcome! I’m more of a za’atar fan (not so keen on hazelnuts in traditional dukkah) but that’s why I like to give options so as to suit more people. Most of my recipes are glorified ideas so adapting is always welcome! Thanks for commenting. I can see I’ll have to give za’atar a go as well then! Well, I’ve just tried a dukkah without hazelnuts and I am now a convert. It’s from Steenbergs (love their spices and blends when too lazy to mix my own). What kind do you use? To be honest it does depend on how lazy I’m feeling! I’ve tried various versions, even dare I say it, Tesco’s, but I’ll have to look up Steenbergs for those days when I’m just in too much of a rush. You and I think alike. All of the Med-East spice mixes are great ways to perk up breads and anything a bit plain. Za’atar is great added into a white bread mix, along with some thyme or oregano and then made into flatbreads. Yum! Your post was so much fun to read! London sounds lovely! I have never tried dukkah, so I am intrigued. I do use chick peas quite often and am going to try your salad. I very much enjoy recipes that are simple yet full of flavor. Thanks for sharing! Thanks Deb. I was in such a rush to eat that I didn’t take that great of photos for the recipe (it deserves better), but I’m glad it looks good to you. I really favour za’atar over dukkah as I’m a real nut for the lemony smack of sumac. Plus, anything that deep in colour has to be extra good for me. I love your take on this. We have to make chickpea salad at least once a month during the summer. I’m a once or twice a week chickpea salad girl myself. Such a quick meal to make up, and portable too. 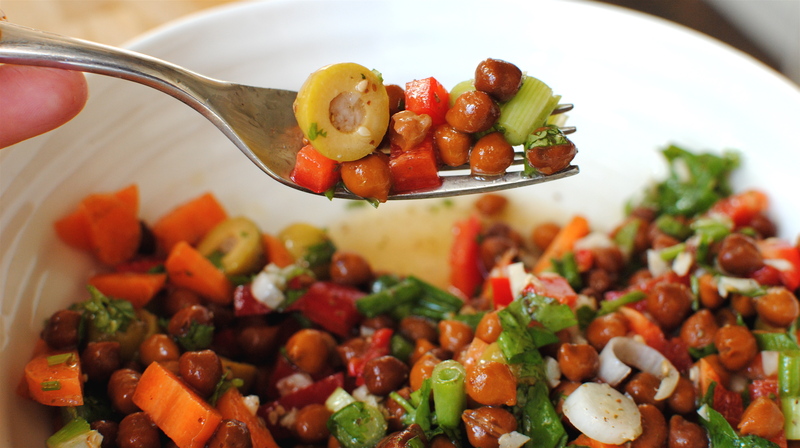 So many permutations that anyone who likes chickpeas should definitely try them in a salad. As it gets cooler I roast the chickpeas in olive oil and warm spices then toss together with warm quinoa and all the salady veg and herbs. Yum! Made this yesterday evening, without the olives (none in the cupboard) it was very tasty, I also think it might work with mint, might try that next time. Going to buy some Za’atar to try as well.